Gnu Foods describes itself as “…a small company that makes all natural, great tasting foods that help address specific nutritional needs and health conditions.” Founded in 2004, its “Gnu Bars” are its first (and so far, only) product. Each bar contains a blend of soluble and insoluble fiber that – according to the company web site – is equivalent to 4 8 oz glasses of Metamucil. The bars come in 5 flavors: Peanut Butter, Cinnamon Raisin, Chocolate Brownie, Orange Cranberry and Banana Walnut. Manufacturer’s Description: …Gnu Bars make getting your fiber so easy. Our individually wrapped bars can go with you anywhere. Throw one in a gym bag or a desk drawer for a quick “pick me up.” You can have healthy, delicious fiber anytime; no mixing, measuring, or stirring required. Our baked, chewy and delicious Gnu Bars can be enjoyed on their own, anytime, anywhere. Other Ingredients: Gnu High Fiber Blend™ (whole rolled oats, organic whole wheat flour, wheat bran, organic kamut, psyllium, flax, millet), chicory root inulin, fruit juices, rice dextrins, rice, canola oil, peanuts, apples, plums, natural flavors, wheat protein isolate, salt, baking powder. Comments: When I visited the Gnu Foods website, I was favorably impressed by the fact that they have an inexpensive “sampler pack” with one of each bar flavor for $9.95 – including shipping. There’s a wide variety of purchasing options, in fact: single bars, 5-bar packs and 16-bar packs, as well as a monthly “Joy of Fiber” autoship program consisting of 15 or 30 bar units, with a savings of 35% off the regular price. 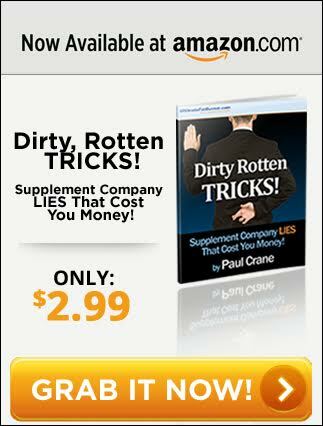 Unlike the supplement company rip-off tactic Paul discusses in his video and “Dirty Rotten Tricks” e-book, however, the Joy of Fiber program is a separate option – so people interested in trying out the products aren’t at risk of being automatically enrolled. So…nice job, Gnu Foods! I like trying out new bars, but many in the sports nutrition market are sold online in units of 10 – 12 (or more), which makes sampling a pricey proposition. The bars are pretty tasty, too: moist and fruity, with a grainy texture and bit of a crunch. Although they’re uncoated, they weren’t the least bit sticky, which was a plus. The fruit flavor really came through with the Orange-Cranberry, which was my favorite of the five…it had a distinctive citrus flavor that tasted fresh and natural. By contrast, the Chocolate Brownie bar was the one I liked the least: it was ok, but I thought it was a little flat and dry-tasting. One drawback to the bars vs. an over-the-counter fiber supplement such as Metamucil, is that the latter is typically dissolved in water…and water/fluid intake is important with any fiber supplement (or food equivalent). The Gnu Foods site does point this out: “As you increase your fiber intake, remember to stay hydrated and drink plenty of water“, but it’s not highlighted, and could be missed if the information on the site isn’t read carefully. Overall, Gnu Bars are a pleasant and convenient (if somewhat more expensive) way to consume extra fiber. In my opinion, people should be getting their fiber from fruits, vegetables, legumes, whole grains, etc., vs. snack bars or supplements, but Gnu Bars can certainly make a contribution, particularly since they’re made with whole grains, seeds and fruit. One bonus: they’re also low in calories and can help take the edge off an appetite, so could be a good addition to a reduced calorie diet.